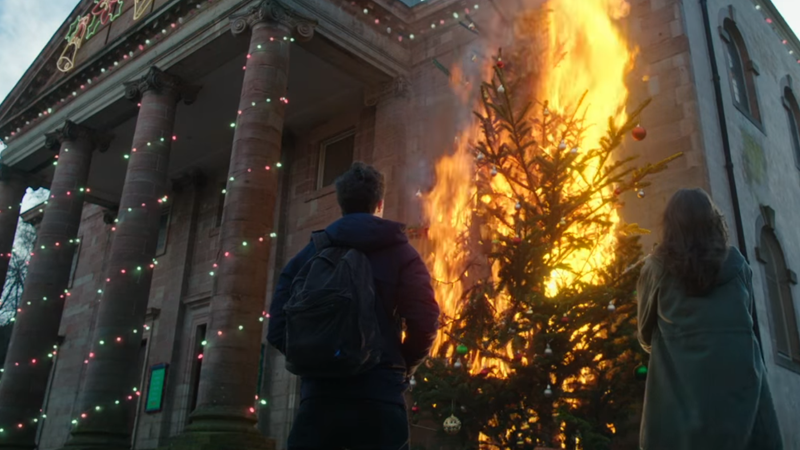 Well, that’s one way to light up a Christmas tree. The more we see of Anna and the Apocalypse, the more we’re charmed by its heady mix of teen shenanigans, almost-annoyingly-catchy musical numbers, and the fact that it’s all that and a zombie movie. This latest trailer ticks all those boxes again, to lovely effect. Prior trailers gave us some teases of what to expect from the film’s bizarre combination of gore, tinsel, and singing, but this latest one lays out everything a bit clearer: Young Anna (Ella Hunt) finds herself navigating a humdrum school life until, in the run up to Christmas, chaos descends on the world as a viral outbreak turns people into zombies. Plus: choreography! There’s plenty of laughs in this trailer, like Anna dancing her way through the end times oblivious to the horror around her, and a few more snippets of the film’s songs. Throw in a dash of the almost pre-requisite zombie-movie-as-social-commentary for good measure—#EvacSelfie, anyone?—and you’ve got yourself a really fun looking movie. Anna and the Apocalypse hits theaters just in time for the festive season, with a limited release on November 30 before hitting wider in December.